I’ve got a good hour of light left, but it’s dim enough that the living-room window looks cozy as I pass it, and I pause, torn, reluctant to turn away. Inside, two heads lean together, conferring in front of the record player, your grandmother’s grey, yours brown, both equally tousled. A Sesame Street record starts to play. I make myself keep going, past the For Sale sign and into the street. Goodbye for now, mi choza, I think. Choza, one of the first words your father taught me. Literally a hut made of palms, but also a comfortable slang word for home. This home, for a few nights more at least, is mi choza gringa, my stateside place to hang my hat during the pat thirteen years. I’m not from this town, which has always made visits particularly luxurious. I never run into a former crush at the coffee shop or a hated teacher at the hair salon. There are only good memories here. Your dad’s first glimpse of snow. Our quiet, joyful wedding at your grandmother’s church. Fleeting, perfect family reunions. Your first steps on U.S. soil. August evenings like this one, cool, almost crisp, edging towards autumn. My feet turn towards my favorite route, around the block and down the hill towards a farmhouse I love. As I run, I realize that while I’m not from this place, or anyplace, really, I am from the things that surround me at this moment. 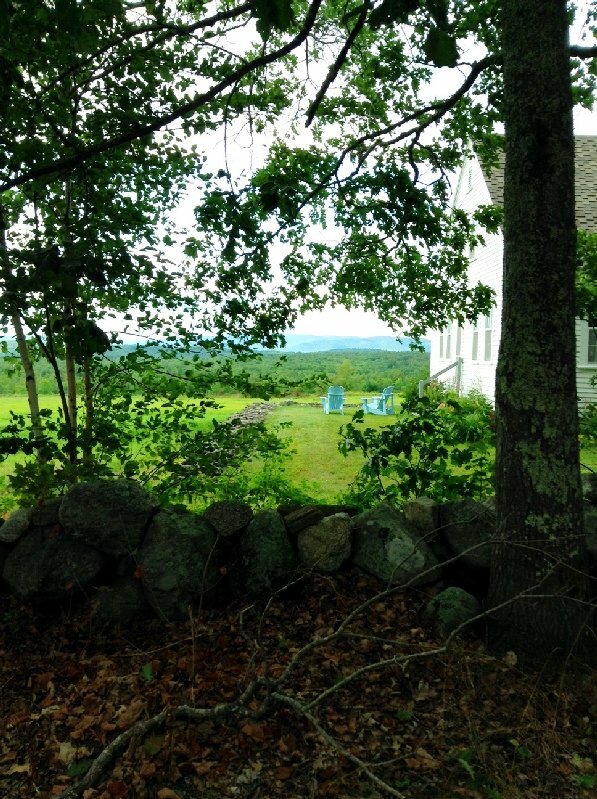 I am from the soft colors of New England, rather than tropical brights – weathered farmhouse red, muffled yellows and oranges of summer fields, palest green lichens on stone walls, blues of distant hills. I am from the sweet smell of cut grass. I am from the local meeting I pass in the old stone jailhouse-turned-library, where high-backed wooden chairs stand in a half-circle in the warm lamplight, your grandfather among the attendees, glimpsed as I run past. I am from wide fields and the sound of crickets and dry leaves in the ditches. I am from cemeteries with thin, crooked headstones. I am from these lean woods, full of leggy birches, spacious and tall even in the lushness of summer, with soft red needles below. At one point, the beauty around me slows my legs like molasses and roots me to the spot. I look at the pink-grey clouds, the open fields, and am at home. This isn’t my hometown, I guess, but I know these stones and skies. This isn’t a place I learned to love, like San José – this is a place I love without thinking. But both kinds of love have their role to play. I reach the farm and find that the sun is finally setting, blazing across the flat, still waters of the farm’s ponds. There’s fire among the rushes, a willow turned to gold. I loop down to the driveway and turn back, and the moment is gone. That slow summer sun disappeared quickly, in the end, just as it does in Costa Rica. I think of it setting in San José, where your dad is hard at work. I wish he were here. I suddenly feel the need to see you right away. Jale pa’la choza. I push up the long hill, wistful. As I run, I tell myself that I can take it all with me, that home is no longer a place, or even a country. It is the colors and smells and sounds I remember. Even as I think this, I’m not sure it’s true, but one thing I do know: for now, and as far into the future as I care to imagine, mi choza is wherever you are.